Baseball today at Home VS St. Joe. 4:00 This is our LAST Home Baseball game. Senior Baseball night! Come out and cheer for the COLTS and wish our Seniors well! Golf team travels to North Delta today. They are dismissed at 9:00. Good luck Colts! Tomorrow - 8th grade class picture at break. Chapel tomorrow during Student Support in the Library. Chris Cauthen will be our speaker. Junior High District Track Meet on Wednesday. Don't forget! 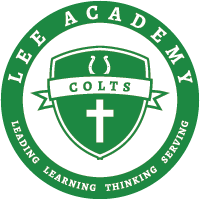 The Lee Academy Junior Class will have an Easter Bake Sale tomorrow from 4:30 p.m.- 6:00 p.m. in the Commons. We will have a large variety of delicious Casseroles and Desserts. Thank you for your support! We hope to see you all there. Next Thursday, April 20 at 7:00, The Griot Youth Program will host an Open Mic/Poetry Slam at the new Meraki Coffee Roasters store located at 282 Sunflower Avenue. $2 for students, $5 for adults. Sign up by April 18. This is a great opportunity for students to come out, participate, and enjoy the Griot Arts Program! Meraki Coffee Roasters is open until 5:30 pm every day except Mondays. Young Life is selling Hams for Easter. You may pick up at the Expo between 1-5 on Thursday. Hams are $40. Tickets on sale in the office.